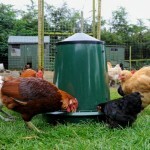 The King Feeder has a capacity of 25 kilograms of feed. Floor standing, or hanging, it is complete with a lid to prevent perching and fouling of the food. Manufactured in the UK, in polypropylene, the whole assembly is corrosion free with an infinitely adjustable feed rate. The feed pan size is 480mm. This King feeder is perfect for any poultry keeper who keeps a larger flock, this feeder can be used as an indoor floor based or indoor hanging feeder, it comes with a lid supplied to prevent the birds from perching on the feeder this also helps to keep the feed clean and fresh. 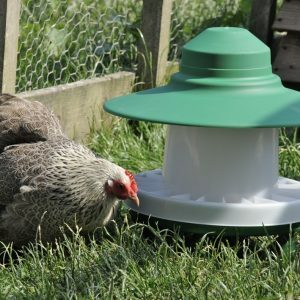 The King feeder can also be used very successfully outside as it can be fitted with a specially designed rain hat that gives total protection from any inclement weather. With a capacity of 25kg this makes it one of the largest feeders available on the market today and one that is ideal for all situations. 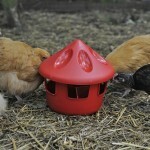 Made in the UK the King feeder is very easy to clean and maintain, the rain hat fits easily and as a general feeder it is ideal for all breeds of Chicken, Turkeys and Waterfowl and I recommend this for use with your egg laying hybrid flock . Be the first to review “25kg King Feeder” Click here to cancel reply.